New Delhi: Allegations were levelled in the Supreme Court against law minister Salman Khurshid and two top officials in the Central Bureau of Investigation (CBI), claiming their interference in the Essar Group-Loop Telecom case and preventing charges being filed against public officials. Counsel Prashant Bhushan’s application alleges that CBI director, A.P. Singh, and director of prosecution, Abdul Aziz, “facilitated the exclusion" of DoT officials in the chargesheet, which was filed against the Essar Group and Loop Telecom on Monday. Bhushan said Singh and Aziz had overruled the investigating officers in the case. 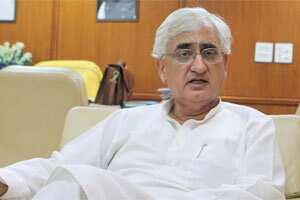 An opinion from the law ministry, which defined so-called associate companies, has led the petitioners to allege that Khurshid is responsible for “interfering" in the 2G case. The opinion was used by defence counsel who argued that charges against Reliance Telecom Ltd and Swan Telecom India Pvt. Ltd should be dropped since the latter was not an associate of the former. Since the case of Essar and Loop is similar—where the chargesheet says Loop was a front company for Essar at the time of application—the petitioners contended: “The interference of an influential minister in the government, the law minister Mr Salman Khurshid, is evident. He is publicly giving clean chit to Essar/Loop. It is to be noted that this case is similar to that of Swan-Reliance wherein CBI has already filed chargesheets against officials of Swan, Reliance and... public officials." Khurshid could not be immediately reached for comment. Besides the above charges, the petitioners also raised questions on two other companies Shyam Telelink and Alliance Infratech, granted licences and spectrum in 2007-08 by former minister A. Raja. They also claimed CBI is going slow on the Dayanidhi Maran-Aircel Ltd-Maxis Group, in which Maran is facing a quid-pro-quo corruption charge. The case is likely to come up for hearing in the apex court in January.